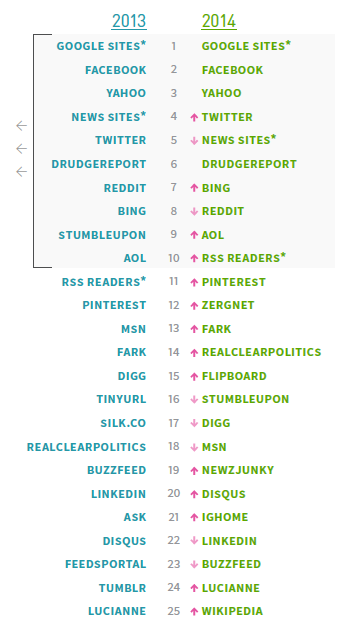 According to Parse.ly’s quarterly Authority Report, Facebook is still the best social platform for publishers looking for exposure. The site saw a 10 percent increase in referral traffic to publisher sites this August, compared to the data from a year earlier. Parse.ly analyzed data from over 10 billion page views and more than 100,000 posts across its network to track online reading trends in an effort to determine peak reading times and referral traffic patterns. The report found that reading times peaked at 12:18 p.m., at which point desktop page views outperform mobile. 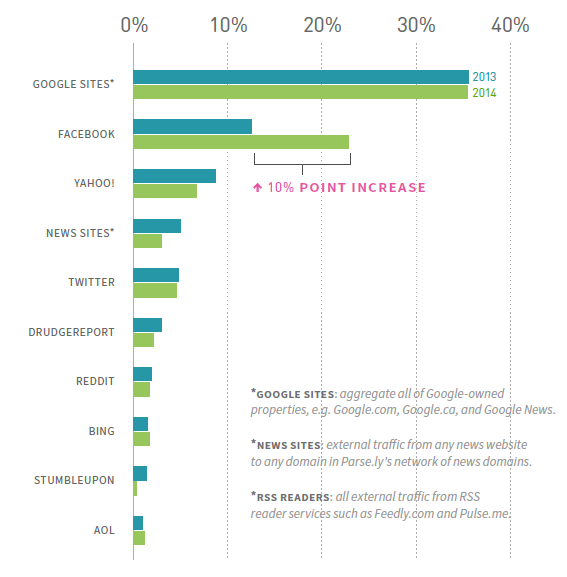 While Google was still the lead referral traffic, Facebook continues to hold the second spot making it the top social network to send traffic to publisher websites. Surprisingly, the report shows very little change in traffic patterns over the past year, with Facebook being the only site in the top 10 to experience a significant increase in the amount of traffic sent to publisher sites. Parse.ly’s report also noted that traffic from social sites had risen seven percent over the past year, while traffic from search sites fell by four percent. You can get more insights from the downloadable report here. Tomorrow marks a rather significant change in Facebook policy as they close the so-called “like gate.” As announced in August, Facebook has decided that pages will no longer be able to require likes to enter contests or view content. Facebook said the change was intended to guarantee people are only using likes on pages they really want to engage with, not due to “artificial incentives.” Interestingly, this is also one of the few changes Facebook has made recently to receive widespread praise. Most social media and marketing professionals agree like gates were far from the best means of achieving the desired result, often drawing in many who have no real interest in a business. 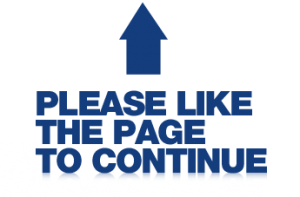 Emeric Ernoult, CEO of AgoraPulse, gave the example of pages which used giveaways of iPads or other popular consumer goods to inflate likes. After Facebook’s success with video ads, it was only a matter of time before Instagram rolled out their own video ad options. According to Ad Week, you can expect that to start today as the Facebook-owned social image and video platform finally launches their own video ad platform. The only catch is the service is reserved for only five major brands: Disney, Activision, Lancome, Banana Republic, and the CW network. Instagram’s ad platform is still relatively young, and it has been very cautious about how they go about serving ads to the public. Under the current system, CEO Kevin Systrom has said that he personally reviews every ad before it is allowed to run on the platform so that they don’t come off as aggressive or poor advertising. The caution payed off as initial skepticism and criticism of ads on Instagram quickly died down when image ads first began appearing. It sounds like the method may also pay off for the video ad service. The Ad Week article says Instagram has reported positive brand awareness and ad recall from testing and that all launch advertisers were striving to be perceived as innovators. The video ads will begin appearing today and roll out more extensively in the next few weeks, and each ad will have a 15-second maximum length similar to the restrictions placed on Instagram users. Videos will also be muted unless users tap the volume control. Banana Republic’s ad, embedded below, used Facebook’s Hyperlapse app to create the video. You can view other ads at Ad Week.